Northern California was hit by a magnitude 6.0 earthquake just outside of Napa at 3:20 am this morning. You saw the damage reports elsewhere: here's all the geoscience behind what happened, and what to expect next. Californians woke up to the largest earthquake in the Bay Area since the infamous 1989 Loma Prieta interrupted the World Series and collapsed the Bay Bridge. While the human cost is relatively low — dozens of injuries reported with no fatalities — the epicentre in the heart of wine country and its historic buildings will make this an expensive disaster. You can learn about the human impact, fires, broken water and gas mains, brick and adobe buildings crumbling, ruined wines, damaged roads, and even lost sleep from pretty much any news source in California, so we're going to skip over that and get into the geoscience of what happened, and what to expect next. The surface of our planet is composed of rigid plates that move around at about the same rate our fingernails grow: centimetres per year, and meters over a century. That movement isn't smooth: the plates catch, grind, warp, and release. Earthquakes happen when a caught portion deforms under stress, then breaks free, catastrophically releasing the built-up energy. Before allowing your fingers to snap, push them together and sideways. Allow friction to keep them from slipping. When you apply enough stress to overcome this friction, your fingers move suddenly, releasing energy. The same "stick-slip" process goes on in the earth. Stress builds up until just like your fingers finally slipping past each other, the rock breaks, moving suddenly along the fault. Like the audible "snap!" made by your fingers carried by sound waves, an earthquake produces energy released as seismic waves, low-frequency acoustic waves. The Bay Area is on a transverse fault zone: the Pacific plate is moving past the North American plate, scraping along the San Andreas Fault. While California's earthquakes will never lead it to falling into the ocean, the Pacific plate is on a steady journey north, carrying anything on the west side of the fault along with it at a rate of 3 to 5 centimeters a year. This type of motion is called a right-lateral or dextral strike-slip fault: if you're standing on one side, the other side looks like it's moving to the right. Transverse fault zones typically produce relatively frequent small to moderate earthquakes with periodic large earthquakes. The faults slip sideways; they rarely have substantial vertical displacement. In contrast, subduction zones where one tectonic plate is diving under another usually have less frequent but downright massive megaquakes, and the faults have a lot of vertical displacement that can trigger tsunami. A plate boundary is often not a discrete line you can stand astride like the meridian line in Greenwich, but is instead spread across many faults, across an area tens or even hundreds of kilometres across. While the San Andreas Fault is a specific fault line, it's also the collective name for a 70-kilometer wide shear zone of individual cracks and faults along the boundary between the two plates. The entire fault system is nearly 1,300 kilometers long, and extends at least 15 kilometers deep into the crust. 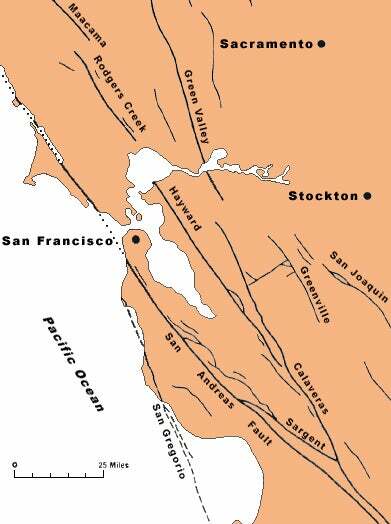 Within the Bay Area, the main San Andreas Fault cuts through San Francisco and sections off Point Reyes. Many other faults within the zone are also prominent and active enough to earn names — the Hayward Fault shows up in real estate paperwork, and Rodgers Creek shares a name with a Vineyard. Many of these faults, like San Joaquin and Green Valley, are the structural underpinnings of the long valleys characteristic to the region. Even more faults don't have names at all, especially if they haven't had major damaging activity in the recent past. Today's earthquake was between a pair of active fault systems, the Hayward-Rodgers Creek Fault system and the Concord-Green Valley Fault system. The epicenter is near the West Napa Fault, which has ruptured sometime in the past 11,000 years, and the Carneros-Franklin Faults, which haven't ruptured in longer. We don't know which fault this earthquake happened on yet. At the moment, the USGS is eyeballing the Browns Valley section of the West Napa fault, but it will take local geologists time on the ground investigating before we know exactly what happened. It's entirely possible this earthquake occurred on a blind fault — a fault covered by sediments with no recent movement that we didn't know about until today. The earthquake research group at UC Davis got started on the local investigation: geology graduate students Alex Morelan and Chad Trexler spent the day tracing the fault rupture, with professor Mike Oskin remotely analyzing the data from his interrupted vacation in southern California. Getting into the field this fast before repair crews hide the data is incredibly impressive. They've traced out a 16 kilometer-long surface rupture with a maximum offset of 25 centimeters. They even found a step-over in the surface rupture, and are tracing out a fault that hasn't been mapped before. This is the definition of preliminary data and should be treated cautiously — after spending the full day in the field measuring I suspect they haven't had a chance to double-check their numbers between field notes and digital record yet. Enough of the background, what actually happened with this specific earthquake? The USGS reports that the shaking lasted 10 to 20 seconds; residents are describing it as quivering or hopping. The epicentre was 11 kilometers deep, a shallow earthquake with more intense shaking felt over a smaller area. California is littered with seismometer stations, all carefully measuring every quiver and rumble in the state. Before getting into how the earthquake shaking was felt in the region, it's important to get a feel for the geologic history. Geology of the Bay Area. Interactive version here. Image credit: USGS. The Napa Valley is downwarping from large-scale regional folding and faulting, evolving over the past 2 million years with ongoing deformation. The valley is home to the Napa River. Before people started messing with it, the river was a low-gradient braided river with annual floods that built up a thick layer of rich sediments across the valley floor. Now it's constrained from flooding, the channel has straightened, narrowed, and is incising more deeply. The mountains stretching to either side of the valley and occasional outcrops within the valley are nearly-bare bedrock. The bedrock to the east and northwest are volcanic, while old compacted sea floor sediments ring the west, northeast, and southeast of the valley. The earthquake was located on the northeast shore of San Pablo Bay. The bay mud and shoreline landfill are loose, saturated sediments that amplify shaking. It's the perfect scenario for liquefaction, the sudden loss of strength and stiffness of geological materials. The recorded intensities by seismometers at the various point locations are used to produce a ShakeMap, a map of recorded shaking intensity in the region. The shaking is understandably highest closest to the epicentre, 6 kilometers northwest of American Canyon, and dropping off with distance. The shaking is amplified in places with loose sediments — valley floors — and attenuated in bedrock — the mountains. California's extended drought means that the ground is painfully dry, limiting liquefaction that commonly occurs when saturated soils are shaken. The felt intensity is always intriguing to me. Crowdsourced by Did You Feel It? reports, the perceptual map is a factor of not just distance and surficial geology maps, but is a reflection of if people were awake and paying attention, the building stock, how familiar with earthquakes they are, and more. If you live in the region and haven't yet, please fill out a report. Even null reports saying you didn't feel anything are useful, as they prevent overestimates by biased self-reporting in areas with mild shaking. While it seems unfair that California is getting stacked disasters with the ongoing extreme drought and now a substantial earthquake, that overlap is a good thing in a twisted way. Modesto geologist Garry Hayes pointed out that if this earthquake had happened when water was more abundant, the aging levee system protecting islands within the Sacramento Delta would have been saturated, and vulnerable to liquefaction during the earthquake. If those levees succumbed, their inundation would have drawn saltwater from the bay up into the delta system. Along with local ecosystem impacts, a saltwater transgression could easily have reached the California State Water Project intakes. Considering the Delta is the water supply for two-thirds of Californians and supports central valley agriculture, contaminating the water intake would've been disastrous. That's not the only relationship between the drought and earthquakes: freshly-published research suggests that groundwater depletion in the San Joaquin Valley is linked to crustal flexing in the adjacent mountain ranges, potentially increasing seismicity of the region. We can't predict earthquakes, but we can get early warnings. It's impossible to predict the exact timing of an earthquake, but we can take advantage of the different velocities of seismic waves to create earthquake early warning systems. Systems already exist in Japan and Mexico, but California does not yet have a functional, funded system. Earthquakes produce a variety of seismic waves, each with different characteristics. The P-wave is the fastest wave, a pressure wave that can propagate long distances, and is always the first seismic wave to arrive. The warning time is measured in seconds, with slightly more warning the farther away you are from the epicentre, but even seconds can make a huge difference. That's enough time to put critical infrastructure in lockdown, to get out of kitchen before dishes come raining down, or to grab a baby and hide under a heavy table. Issue a warning to people in locations that may expect significant ground motion. Right now, the ShakeAlert system can do all of those things. It's been doing it so well and so reliably that the tool has been made accessible to 150 private organizations including the Bay Area Rapid Transit system. What it needs is funding for a public implementation. Richard Allen, director of Berkeley's Seismological Laboratory and one of the lead scientists on this project, predicts that the project needs $120 million for the first five years of rolling this system out to the public. That's 64 cents per person living in California per year, or an up-front lump sum of $3.15 each. If you live in California and are currently boggled that you could've gotten a warning to your cellphone, computer, or television counting down the seconds until this earthquake hit, and want that warning before the next earthquake, start demanding that your local politicians fund this system, now. It's a frustrating political reality that no one wants to spend money on mitigating disasters until it's too late. This earthquake was bad, but not a catastrophe. Let's use the attention and momentum of this near miss to get this thing funded, and not keep waiting until it's too late. A magnitude 6 earthquake is big, but not "The Big One"
Despite the shaking, damage, injuries, and fear, this earthquake wasn't the Big One. Earthquake magnitudes are on a logarithmic scale. Each integer number increase in magnitude reflects ten times more ground motion, and 32 times more energy released. While it sounds like a magnitude 6.0 and a magnitude 6.9 are close enough to get lumped into the same category of earthquakes, their impacts are dramatically different. Today, five earthquakes were recorded by the same seismic monitoring station in Norway: a series of small earthquakes including a 5.3 in Iceland related to magma shifting around the subglacial volcano Bárðarbunga, a magnitude 5.3 earthquake near Shush, Iran, more Icelandic rumbling with a magnitude 4.9, the strong magnitude 6.0 in California, a magnitude 5.2 just outside Aglasun, Turkey, and a magnitude 6.9 in Peru. And yet, this earthquake was smaller than the magnitude 6.9 Loma Prieta earthquake that devastated the Bay Area in 1989. At just 0.9 steps smaller in magnitude, this earthquake released less than a twentieth the energy. A 2008 study worked out that the probability of a magnitude 6.7 or greater earthquake within the Greater Bay Area within the next 30 years was 63%. When the impact of today's earthquake are worked into the next batch of geophysical models for the region, those probabilities are going to stay pretty much the same. It released energy, but not enough to appreciably relieve tectonic stress within the region. It'd take another at least another ten earthquakes of the same magnitude or greater to relieve the same amount of energy as just one magnitude 6.7 earthquake. When a portion of a fault moves, the earthquake releases the stress built up at that fault, but increases the stress on the stuck ends that didn't move. This redistribution of stress is why aftershocks happen, as the added stress pushes other stuck areas over the breaking point to slip as another earthquake. [A]ftershock sequences happen, and that the number of them decrease with time, but not necessarily the size. Using their most recent models, the USGS and UC Berkeley are projecting between 30 and 70 small aftershocks, magnitude 3.0 to 5.0, will hit the area in the next week. That one of those will be a strong aftershock that will produce additional damage sits at 36%: just over 1 in 3. Although rare, it is possible that this earthquake was actually a foreshock, a precursor to a larger event. The odds of having a larger earthquake in the same area within the week is between 5 and 10%: small, but not impossible. It's irritating, but the only way we know if an earthquake is a foreshock is to wait and see if a larger earthquake shows up. One of the most valuable things in the immediate aftermath of a disaster is information. Social media, particularly Twitter, can be an amazing resource for going directly to trusted authorities for accurate, up-to-date information without needing to wait for press releases to make their way into articles or broadcasts. The Napa Police Department did an outstanding job today, putting out a steady stream of need-to-know information from downed infrastructure to instructions for getting a home inspection. They also took the time to respond to citizen queries, directly addressing misinformation before it had a chance to spread. It can be a hard sell to convince under-funded, over-worked emergency planning departments to take on the task of establishing a social media presence, but whoever is running that feed today has justified that effort many times over. California has excellent seismic building codes, and a population that is well-acquainted with their state's tendency to shake things up. While this doesn't make earthquakes any more fun, it does mean that the state has substantially invested in seismic retrofitting and engineering designs to reduce damage from earthquakes. One of the tricks to reduce damage is to design structures that can accommodate movement. This expansion joint is a good example, allowing the concrete to pull apart without fracturing the onramp. 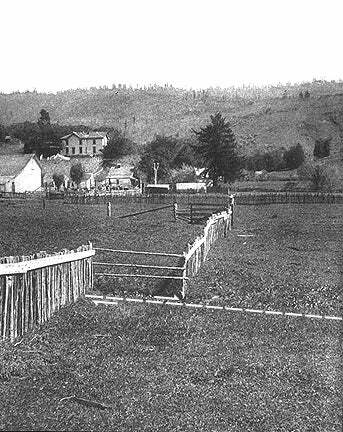 The rolling hills of wine country are also home to beautiful, historic villages and wineries that are truly delightful to visit, but use building materials that predate seismic codes. Buildings dating back to the mission days of California are adobe, a mud-block construction that breaks easily under stress. Those from the gold rush are more likely to be brick, pretty much the worst building material for surviving an earthquake. Update your disaster plans and refresh emergency kits. This is good advice for everyone, even those smugly satisfied that they live far away from tectonic boundaries or injection wells. Wherever you are, you're at risk to some sort of natural disaster. Learn your local hazards, and plan accordingly. If you live in the Bay Area, you can look up expected shaking intensity for your neighbourhood. You can also check out more resources at San Francisco's 72-hours emergency preparedness hub. Those twiddly little straps that come with bookshelves are enough to secure light furniture to the wall. Strap down televisions, use tacky to secure display items, and avoid placing heavy items on the top shelf. For a fast, stylish way to learn about securing household objects, play Beat The Quake and see how much damage you can prevent. Admittedly, sometimes securing objects is easier said than done. While supermarkets can clean up toppled merchandise with a bit of work and not too much loss, the winemakers and oil pressers in Napa are having a day of painful losses. Finding a trade-off between securing their stock and keeping it accessible enough for daily activities is a challenge I don't envy. Set up an out-of-area contact. During an emergency, communication systems can get easily overwhelmed. Instead of trying to make multiple calls, designate one person outside your geographic area who is unlikely to be caught in the same emergency. You contact them to check in and at the same time get the good word on any of your other friends or family who have checked in instead of all of you trying to contact each other. If you are stuck, remember that landlines and mobile phones use different networks. One may still be functional while the other is down. You can also try SMS messages — even if the system is busy, text messages can queue up in a buffer to send when possible. If you're using a landline, keep around a corded phone that will continue to function when power is out (cordless phones require function). Get to know your neighbours. Repeated studies have shown that areas with a better sense of community have higher resilience and survival rates. Host block parties, visit each other's homes, learn where bedrooms are located so you know where to dig if a building collapses. If your partner objects, tell them you're inviting the neighbours to dinner to increase your odds of survival. If you feel shaking, drop, cover, and hold on. If you run outside, you're just increasing your chances of being hit by falling objects — bricks, flower pots, broken window glass, power lines, the list goes on. Instead, find a sturdy piece of furniture that won't collapse easily, hide under it, and hold on so it doesn't walk away during shaking. If you're in bed, curl up and protect your neck. If you're outdoors, either flatten against recessed doorways to shelter from falling objects, or get out into an open space. If you didn't grow up around earthquakes, it can be helpful to run "What would I do?" drills, sporadically stopping throughout the day or week to think about what you would do in a particular location or situation. As always, drop by the comments to ask any questions you have about the earthquake!